Today, technology is more prevalent than ever, and basketball players have access to many new tools to help them better their skills. Athletic training can be greatly enhanced by these technologies, some of which are well-known, some of which are not. From video cameras, smartphones and cell phone applications, to high-tech sneakers that keep track of how high you can jump, technology has come a long way and there are many ways to put it to work for you. Video cameras are probably the most well-known of these technologies. The most common way they are used in sports is for game film, to help a team study their opponents as well as themselves. It is beneficial to relive what we did well and what we need improvement on, and game film can give us a reference point to see exactly what we need to improve on. Another way to use a video camera is by filming practice sessions, zoning in on the smaller details and fundamentals such as footwork and shooting form. Sometimes we don’t notice a flaw at the moment we are doing it, so it helps to have video to correct some of the basics that we may otherwise overlook. These days, it seems like there are two groups of people; those who have a smart phone and those who are about to get a new smart phone. The great thing about these phones is all of the features that you have at your disposal in an easily portable device. The iPhone has apps for weight loss, nutrition, running, and weight training, right down to food and workout logs. Through the use of these apps, athletes can conveniently and efficiently track progress and adapt their workout plans accordingly. 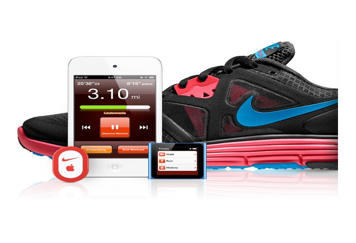 In recent years, Apple and Nike have come together on several products combining sports and technology. The first collaboration by these innovative companies was an electronic sensor used to communicate to a tiny wireless receiver attached to Apple’s iPod music player. This sensor can be inserted under the inner sole of Nike running shoes and is able to tell a runner the current time and distance, amongst other information, of their current run. In addition to this, of course, is the music element of this particular product. Music is often used as a tool while training, so why not use a product that offers you music along with other important training advantages? Shoe technology is one of the most vital technologies for training is any sport. With the right shoe, you really can run faster and jump higher. One technology that is geared specifically toward basketball players is the Nike+ pressure sensor in Nike basketball and training shoes. The sensor in these shoes transmits data, using Bluetooth technology, about the athlete’s movements, and sends the information to their iPhone. Not only can these shoes make you jump higher, they actually track how high you jump to prove it. Clothing is another area where technology has made leaps and bounds. There is clothing specifically designed to keep an athlete cool in the heat and warm in the cold. Some companies have made it a point to specialize in developing innovative clothing to keep athletes comfortable and dry. Most athletes train year-round, regardless of the weather, and these technologies in clothing make training more comfortable, no matter what conditions you face. There is no question that there has been great innovation within the last several years when it comes to sports and technology. These products are just examples of the many modern technologies that exist specifically to improve an athlete’s performance. Taking advantage of these advances is essential to maximize your performance level. Even if you don’t use this technology, odds are that your opponents will. 1 Response to "Using Technology to Become a Better Basketball Player"
I want the nike pressure sensors for my running shoes!